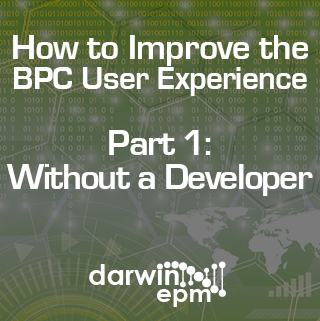 After my last blog post, How to Improve the SAP BPC User Experience, Part One: Without a Developer, I’d like to share five ways to improve it WITH the help of a developer! A developer can assist in enhancing your BPC experience, as they have seen a variety of ways to utilize BPC across companies and can apply different ideas to improve your BPC interface. 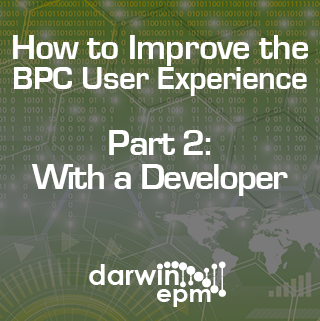 In addition, based on our experience, Darwin EPM has created tools to improve the Excel interface, as well as the experience for BPC users and administrators. Navigation, especially for first-time SAP BPC users, can sometimes be frustrating, even for basic things like finding the right place to enter data or run a report. The screenshot above is an Excel add-in (like the EPM Add-in) with quick access shortcuts to models, templates and data manager packages. This add-in ribbon provides easy-to-reach action buttons to refresh data, send data, show logs, etc. SAP BPC users know that its user interface is built on the Excel platform – making it user-friendly for accounting and finance professionals who already work in Excel for financial statements and other reporting. But how can you improve the Excel experience, either with or without a developer? There are many answers to that question, depending on your budget and your BPC users’ experience. Let’s start with four ways to improve the Excel experience using your company’s existing resources. Learn about EPM best practices and the latest in Darwin EPM software!